We provide K-12 students the tools to become innovators in the fields of science, technology, engineering, and mathematics. Our goal is to empower and inspire future generations of scientists by providing K–12 students the necessary tools to develop fundamental scientific reasoning, address societal problems, and move onto further scientific instruction. 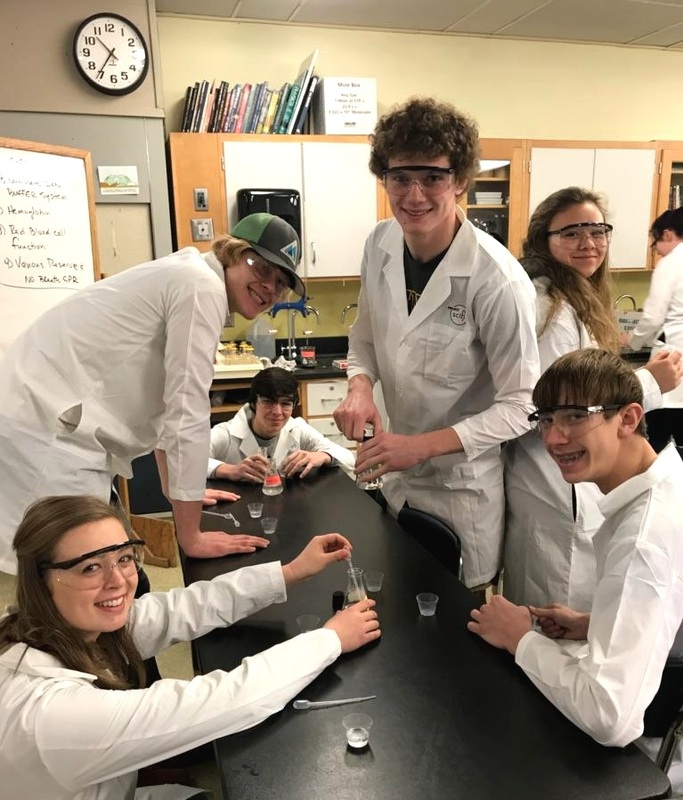 The Scientific Coat Initiative for Future Innovators promotes students’ scientific passions for higher education, provides teachers the resources necessary for hands-on scientific instruction, encourages the growth of mentor-mentee relationships, and fosters a visible community supporting young scientists’ endeavors. We achieve these goals by partnering with corporate and academic sponsors who endorse the purchase of laboratory coats emblazoned with the sponsors’ logos. We then distribute these coats to qualifying under-resourced schools, along with other materials intended to aid educators in taking on a hands-on approach to scientific instruction. Project SCIFI has brought more than $2,000 of lab resources such as lab coats, goggles, and textbooks to 3 schools in Northern California. We have supplied a total of 6 science classrooms in 3 under-funded schools: De Marillac Academy, Trinity High School, and Richmond High School. We expect our donations to have impacted more than 2,100 students for over 5 years. In 2019, we’re going bigger. 12 under-funded schools. 12 months. Starting Jan 2019. Project SCIFI is embarking on an effort to make a larger, more tangible impact in the next 12 months to improve classroom engagement, standardized testing scores, and STEM grade averages. To enable quality education & hands-on science for 20,000 students at $0.63 per student over 5 years. 960 sets of protective personal equipment. IN 2019, PROJECT SCIFI WILL DONATE HANDS-ON SCIENCE RESOURCES TO ONE SCHOOL PER MONTH. We have an incredible team of volunteer students and scientists who are passionate about making scientific experiences available to youths everywhere. We’ve had the privilege of collaborating with amazing organizations. Our partners and sponsors enable us to connect with schools and provide them what they need to create an atmosphere that allows for hands-on learning. Diffusion occurs when particles spread out from each other. They tend to go towards areas of high concentration to low concentration. In this demo the coloring from the skittles gets washed off in the water and moves in the only direction where there isn’t other colors: inward. This makes for a cool and easy try-it-yourself science demo! It is very easy to forget that the air around us is actually always exerting a pressure on us because we are so accustomed to it. With this fun experimental tutorial and adult supervision, you too can see the power of air pressure in just a few minutes! But first, let me tell you the super fun science behind how this experiment works! When our responsible and properly equipped scientists, Chase and Michael, heat the can, water vapor begins to rise. This happens because the heat gives energy to the water molecules inside of the can, increasing their kinetic energy and allowing the liquid to become gas. Using a pair of tongs, Chase grabs the can and puts it upside down in the cold water causing the can to COLLAPSE! Whats going on? Why did this happen? Did Chase just break the universe? No, silly, the answer is SCIENCE! The water vapor expanded and pushed the air out of the can. When the can is put in the cold water, the water vapor condenses to create an extremely low pressure partial vacuum inside the can. The pressure difference between the inside and the outside of the can is large enough that the can collapses in on itself. HOW COOL IS THAT!?!? This is just one of the many ways that you can use simple science to have fun at home. HAPPY EXPERIMENTING! Supercooling is super cool! But, like good jokes, it is also hard to do and film it well, unfortunately. Super cooling occurs when the liquid is below its normal freezing point, but has still not turned into a solid. It needs something to kick-start the freezing process and encourage a small number of the liquid molecules to get together in a crystalline structure. This process is called nucleation. This has definitely been the most difficult demo we have done so don’t get discouraged if it takes you a few tries! This is known as the black snake experiment and believe it or not the science behind this is quite simple. When the baking soda is heated to a certain temperature it starts to release carbon dioxide. This gas accumulates at the base of the baking soda/sugar mixture. As pressure builds up it starts to push the “snake” farther and farther out of the sand. The black color is due to the sugar getting caramelized by the heat. Although it’s difficult to see the “snakes” forming in our video due to the flame, if you try it on your own with adult supervision I’m sure you can appreciate it a lot more! If you represent a company, a research lab, or a university department, please get in touch with us directly. Project SCIFI is always on the lookout for schools whom we can partner with to bring hands-on science experiences to classrooms. Project SCIFI’s membership is concentrated in the Bay Area and we currently are largely represented by UC Berkeley students and alumni. Interested candidates may find us recruiting on-campus near the start of a semester. With your support, Project SCIFI will supply 12 more schools over the next 12 months.